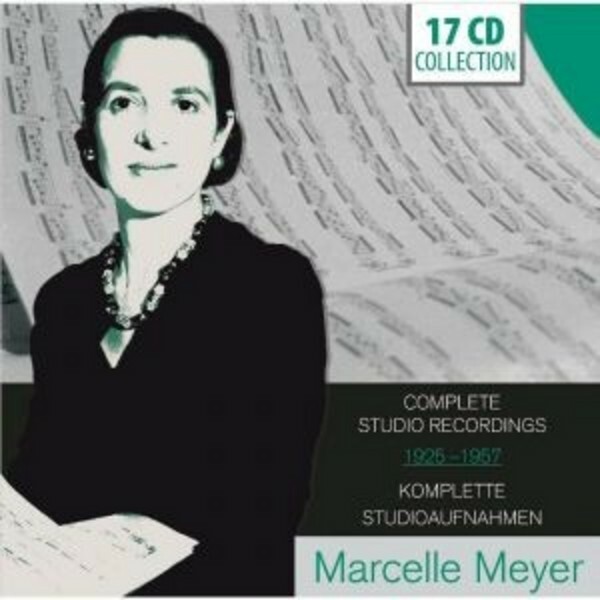 Although she is considered by many to be one of the most influential of all 20th century pianists, the name of Marcelle Meyer is still relatively unknown to all but a few aficionados. This 17 CD set covers recordings from the years 1946 to 1957 that document the high artistic standard of her interpretations. Marcelle Meyer was a student of Cortot and on friendly terms with many composers, writers and artists that worked in Paris during the early to middle part of the 20th century. These included Maurice Ravel and Erik Satie, both of whom considered her to be one of the best pianists around at the time. She was closely associated with the group of composers known as Les Six, as well as Jean Cocteau and Igor Stravinsky. The legendary director of the Ballets Russes, Serge Diaghilev was among her admirers, and she is known to have maintained a close working relationship with Claude Debussy. Meyer was also known for pioneering baroque music and introduced large numbers of the listening public to the works of Rameau, Scarlatti and Couperin.